The D.C. region experienced some periods of dryness Saturday but the continuing wet weather popped up again in the mid afternoon, delaying the already-postponed Nats game that was set to start at 3:05 p.m.
WASHINGTON — After Friday’s washout, the D.C. region experienced some periods of dryness Saturday but the continuing wet weather popped up again in the midafternoon. A sustained downpour delayed the start of the Nationals makeup game with the Chicago Cubs on Saturday afternoon. The game was supposed to start at 3:05 p.m. Saturday, but it was postponed to a 5:15 p.m. start time. 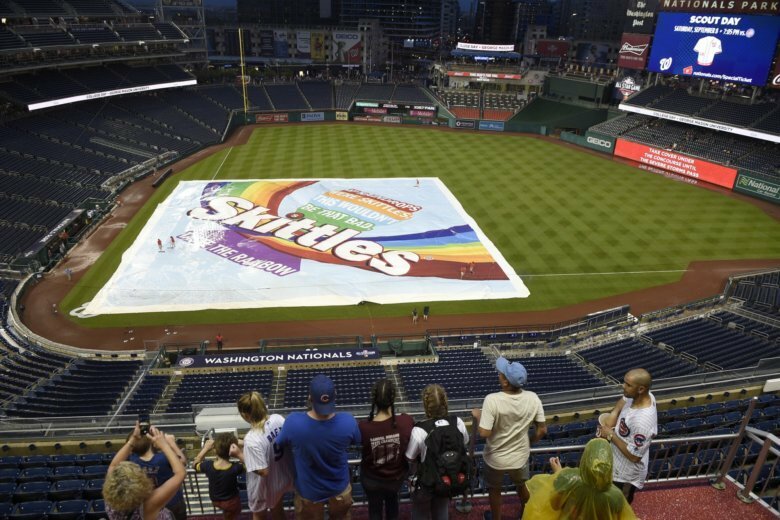 It had already been delayed from its original Friday start time of 7:05 p.m.
Saturday’s delay pushed back the start of the regularly scheduled Saturday night game. However, pouring rain in D.C. delayed the previously delayed second game that was in the middle of the eighth inning. But the wet weather did not stop Washington and Max Scherzer, who threw his second complete game of the season, beating Chicago 10-3 in the first game of the doubleheader. The region is expected to get a good soaking this weekend after September kicked off with a sweltering dayslong heat wave. A flood watch will start for the District and nearby parts of Maryland and Virginia at 2 a.m. Sunday and will continue most of the day. Sunday’s Nation’s Escape Triathlon was cancelled at 2:30 p.m. Saturday due to current weather conditions and anticipated storm activity. The Department of Energy and Environment cancelled the swim portion of the race earlier Saturday after Friday night’s storm and sewer overflow. StormTeam4 meteorologist Lauryn Ricketts tweeted about the weather conditions just before 3 p.m. on Saturday, saying she thought the storm would pass quickly enough for the game to be played. The rain chances are even higher on Sunday, especially in the morning, with one to three inchees possible. High temperatures remain only in the middle to upper 60s. On Monday, the heat returns but the rain chances don’t let up. Temperatures will be back in the mid 80s but with the chance of scattered thunderstorms. Later next week, potential landfall of Hurricane Florence along the East Coast of the U.S. could impact the area — but it’s way too soon to say if it will, Storm Team 4 meteorologist Sheena Parveen said. For the D.C. area, it all depends where Florence, which is still far out in the Atlantic Ocean, hits and how far inland it goes, she said.